I'm playing solo guitar at this event and you all are invited! 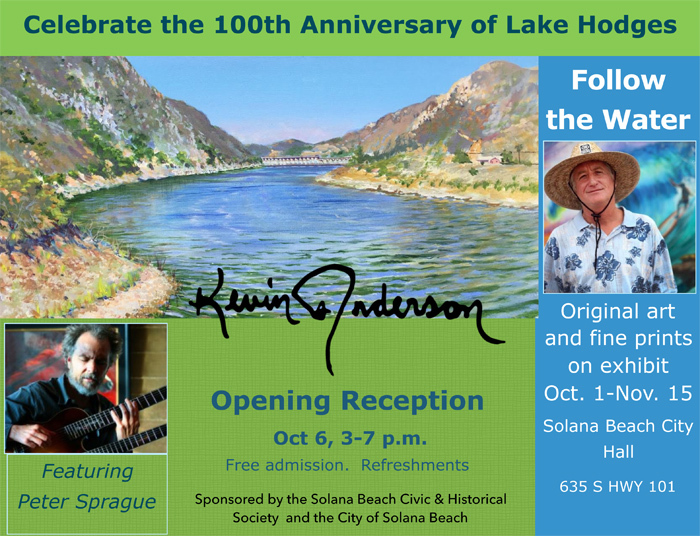 The City of Solana Beach is excited to announce our participation in the celebration of the “Centennial of Lake Hodges”, whose creation made it possible to irrigate the City’s early farms and neighborhoods. The City, along with the Civic and Historical Society, will host the exhibit "Follow the Water" by local artist Kevin Anderson at the City Hall Gallery, from October 1st through November 15th. In addition, the community is invited to the City Hall Gallery opening reception of "Follow the Water" on Saturday, October 6th, from 3:00 to 7:00 PM. Refreshments and entertainment will be provided. Admission is free. A short Lake Hodges Centennial Program and recognition of Colonel Ed Fletcher and his descendants will take place at 4:00 PM. City Hall Gallery is located at 635 S. Hwy. 101, Solana Beach.